I’ve been expanding my baking horizons as of late, and while chocolate cake is definitely not “horizon expanding”, Sourdough Chocolate Cake certainly is. Or at least for me, as the care and feeding of sourdough is a new endeavor. But boy, is it a pain! If my family didn’t love sourdough so much and if I didn’t get that endorphin rush every time I cut into a good loaf, I would just buy sourdough at one of the gazillion bakeries around here. But nope, I’m tending to the starter and will continue to do so until I get tired of looking at it. This cake should prolong the effort. The recipe comes from the same source as my current favorite sourdough bread recipe, King Arthur. 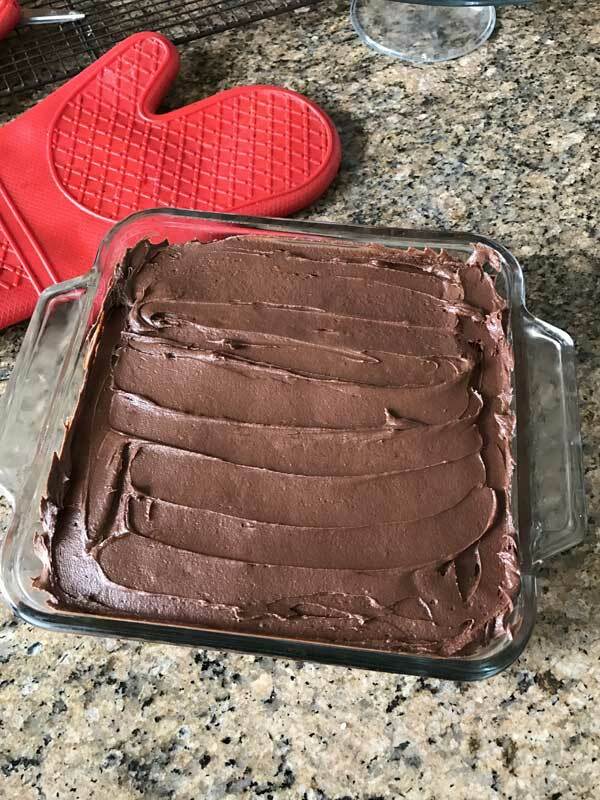 King Arthur makes a 9×13 inch chocolate sourdough cake with coffee frosting, but my version is an 8 inch square serve-out-of-the-dish cake frosted with a reliable and very good cocoa powder icing. It’s a deep/tall cake and the texture has a little give to it. Where the sourdough really comes through is the flavor. Along with the chocolate, you get a little bread-like flavor. Argh, that’s a terrible description. It’s hard to describe and it’s subtle, but there’s more flavor there — and it’s not too sweet! One of the reviewers over on King Arthur cited it as too sweet, but I didn’t find that to be the case. Sorry for rattling on. Try the cake! I wouldn’t say it’s so great that you should start your own starter ASAP, but if you have starter you need to use, it’s a very good cake. I’ll update you if anyone says it’s an amazing or life changing cake or if I can come up with some better descriptors for flavor. In my opinion, it’s a make-again cake and a great way to use up sourdough starter discard. 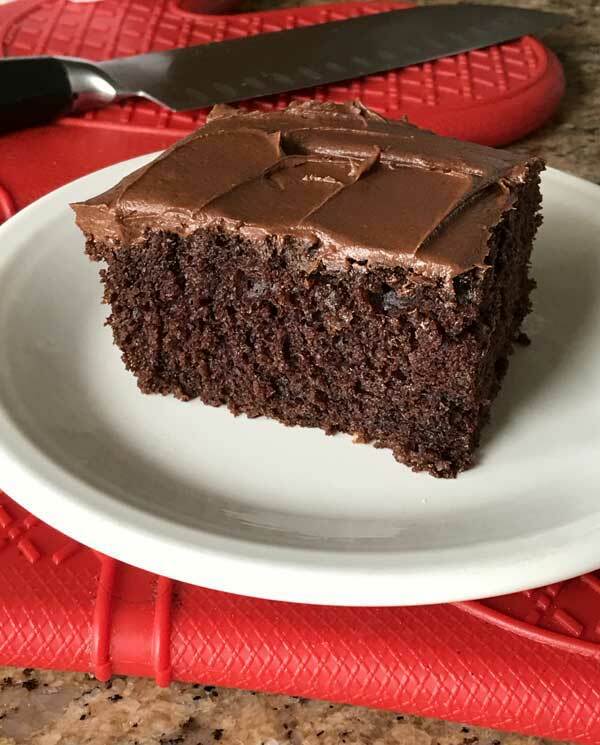 Sourdough Chocolate Cake is an 8 inch square chocolate cake made with sourdough starter. Combine the starter, milk, and flour in a mixing bowl. Cover and let rest at room temperature for 2 to 3 hours. It should expand slightly, but won't appear bubbly or active at this point. Preheat the oven to 350°F. Grease an 8 inch square pan. If using a glass pan, preheat to 325 degrees F.
In a mixing bowl, beat together the sugar, oil, vanilla, salt, baking soda, cocoa powder and espresso powder. Add the egg and beat until well blended. You can do all the beating with a spoon or scraper – no electric mixer necessary. Scrape the starter mixture into the chocolate mixture and stir until well-blended. Pour the batter into the prepared pan and bake for 30 minutes (40 minutes if using 325) or until cake springs back lightly when touched and a skewer inserted in the center comes out clean. Frosting: Mix the butter, sour cream, sugar, cocoa, salt and 2 tablespoons of the half and half until it all starts to come together as a thick sludge. When everything is sticking together, add the vanilla. Increase mixer speed and beat until smooth, scraping bowl and adding more half and half (or milk and cream) as needed until you get your desired texture consistency. Spread over the cake. So far I’ve only made bread with my starter, but your cake looks delicious so maybe my next experiment will be this cake. Does the starter need to be fed, or unfed? When I make my bread I feed it and wait until it is active again, usually 4-6 hours-and then use it. I put the unfed leftover portion in the refrigerator. That’s the stuff I’d like to figure out how to use!!! I know you can make waffles and other items, just have not tried it yet. For a number reasons I probably won’t get to make this cake but it certainly looks delicious! I’ve heard sourdough waffles are amazing too. Have you tried those? Yum, first of all. Interesting, never would have thought of sourdough uses in anything but bread. The key is remembering that you can always put it in the refrigerator for a while and that it will come back. I still have some on the counter than I need to put in a loaf of bread or throw in the refrigerator. I have a starter going too, and am always debating if it is worth keeping, but realized that most of the work (and gambling when it can properly leaven a loaf) is in the initial creation, so I am determined to keep the starter maintained this time :). Anyway, your cake loojs delicious and your description was very good! Chocolate and sourdough are a great combo, I really like it brownies and cake. I am the worst sourdough parent! I keep my starter unfed in the fridge for months sometimes. It always bounces back after a couple of feedings though. Hardy stuff! I’m so excited to try this! I have been tending my sourdough since last November and I make bread with it every week. It will be fun to try something new with it. Thanks for posting!